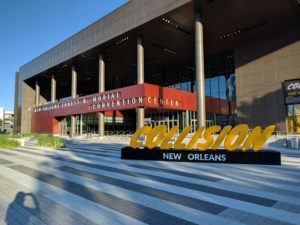 Collision Conf was an exciting tech conference hosted in New Orleans this month. There were a large number of attendees from all over the world. I didn’t realize that there would be over 20,000 attendees! Fortunately everyone fit quite well into the Ernest N. Morial Convention Center. 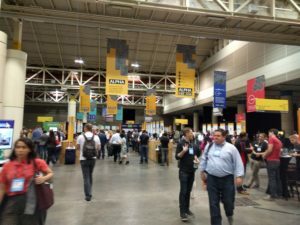 The conference tracks covered a variety of tech-related subjects. Everything from cars, ecology, music and robots to several conferences for specifically for full-stack development, startups and data management. This doesn’t even include the multiple evening Summits that focused on networking. There was a lot of excitement throughout the conference, and I believe a lot of that was from the wide range of startups, want-to-be startups and more established startups! There was a wide range of business ideas. Thwe center area of the convention center was filled with booths for startups relating to: the service economy, ecology, pairing people with services like pet care/haircuts/healthcare, work-focused apps for email and security, or particular interest such as travel for LGBQ folks and beer! As I said, the diversity of interests is incredibly wide. One of the primary aspects of the conference seems to be pairing investors with potential startup businesses. I did see a number of themes in the talks throughout the conference. There were talks about security and who does it- not just big companies. Who are hackers and what is their role in the current economy? Why should regular users care about security? When should companies invest in security? How does security relate to IOT? Open source tools are being used by more and more companies. 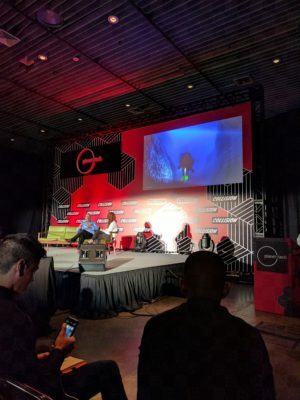 There were talks about how they are used by established tech giants in addition to small businesses just getting off the ground. There was agreement that open source tools are the way of the future. They allow for faster development, better security, and are important for agile development and interactions between teams as well as customers. give them a value proposition. It’s important that you have an authentic brand/message that is built upon the values of your organization, and that your company actions support your values- this is the best way of attracting and keeping valuable customers. Big data was a popular topic. Data is being collected not only by the largest companies but from almost every company. It’s being used to get to know customers, and to build recommendation engines. Open source tools are great way to accumulate data from a wide range of users. Security is an incredibly important subject regarding protecting your company as well as your users. There was a lot of discussion about the motives of companies, and building companies that have motivations other than profit. Some of them had products or projects relating to ecologically friendly themes, but some had a wider message- similar to Mozilla. In fact Mozilla’s Chief Marketing Officer Jascha Kaykas-Wolff was on a panel discussing how companies can build an authentic message/brand. This conference covered an incredible amount of topics in a short period. It was truly a “collision” of topics and interests – all relating to technology. If you’re interested in attending they already have dates set for 2018 at the CollisionConf site. It was great to meet people from such a variety of perspectives, who are all interested in the future of technology. It was also a good chance to measure up where our company stands, based on these interest. I’m happy to say Mozilla gets top marks for openness, transparency, innovation, interest in machine learning, telemetry, recommendation engines, security and more!